Jules Blurb: This is a must have ingredient for any self-respecting chef to achieve Authentic Thai food. 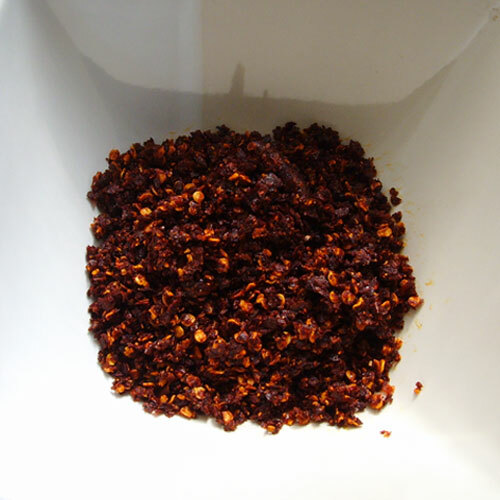 You are going to discover how to make fresh Thai red chilli powder to be used in many different recipes. There are two methods described here which will give you choices of use for the finished chilli powder, so pay attention class!!! Heat oil in a wok or large saucepan (low heat) add chillies & salt, stir constantly until they turn mid/dark brown (not black or it will taste bitter) See above or video for colour, remove and let cool on kitchen tissue to dry out for 10 minutes or so. Pound the chillies until a grainy powder is achieved, use a blender if you don’t have a pestle & mortar, but don’t turn it into dust because you want a granular texture. We have described a simple deep frying method and in the video tutorial we show you the dry fry method which gives a dryer powder. So to clarify for making chilli red sauce the traditional method for flavour is this deep fried version but frankly the dry fry method gives you more choices of use with the finished chilli powder. 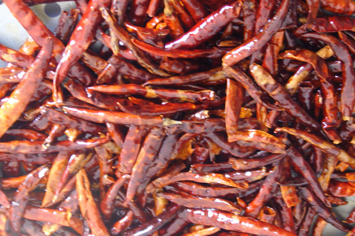 It makes enough chilli powder to make several bowls of red chilli sauce and you can make different styles. Learn more about Thai Sauces here. The dry powder can be used for sprinkling into any dish to pep it up a bit and can also be used to make Chilli Red Sauce – Nam Pik Ta Daeng. It is used in Minced Pork Red Curry = Nam Pik Moo also! Quite a feisty stir fried curry which also contains tamarind puree making for a very unique and special curry indeed! Also supplied on the table at noodle restaurants check our Kwaytiaw Street Vendor Noodles blog video to get an idea. Always protect your eyes when working with chillies. Not all dried chillies are the same! For best results, you really should start with dried THAI chillies which are always available from the local Asian store. I have tried many other varieties or chilli and they are just not the same flavour! For either method (dry of deep fried)…. Store in an air tight container to retain aroma and flavour for weeks. It does not need refrigeration. Please feel free to leave your review below..